So last Friday (8th Feb) I went to a follow up appointment with the gastro team at UCLH. This time I saw a different Dr. She was lovely and easy to talk to; she has EDS herself and we both had Diet Coke and we both agreed its a good cure for nausea and dysautonomia. Based on my symptoms she diagnosed me with POTS (Postural Orthostatic Tachycardia Syndrome). 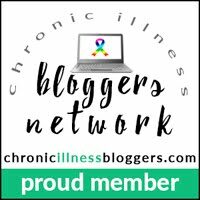 She explained to me that my gastro symptoms where a mixture of all of my different illnesses - connective tissue problems causing my guts to be stretchier and move much slower; FND not sending messages to my digestive system properly; dysautonomia and POTS and M.E. too as well as the effects some of my medication. She's going to refer me to pain management to look at options to manage my chronic pain (caused b all my different illness) as it would be impossible to function without medication but to look past help in managing pain and different pain management options and medication. Having some basic medical knowledge both from when I was studying nursing, but also being a expert by experience (aka being a person living with a disability) she spoke to me in a clinal way and I felt that she treated me at an equal level, unlike some Drs who look down on you because you're the patient and they're the Dr.
She was really happy with what I'm doing with seeing Dr Sally (private Integrative Medicine Dr - I keep meaning to make a post about that!) as one of the things Dr Sally is working on is improving my gut health and intestinal permeability which in turn can help with things like improving my immune system. Anyway, the Dr I saw complemented me on how nice it was to meet such a proactive patient. In my last appointment I was started on a medication called Prucalopride which helps my digestive system to work more normally; my GP was supposed to do a follow up ECG as it can affect the long QT heart rhythm, but my GP who's as helpful as a chocolate teapot failed to do this so I had a ECG after my appointment. On the way home I got a call from her to sat that I had developed long QT syndrome fro the medication so she's going to switch me onto an alternative which will do a similar job as the Prucalopride but will also allow my pain meds to work but stop them affecting my digestive system. She also said that some of my other medications can affect my long QT but I said I've been on them a while and I've had other ECG since and nothing has been flagged up. As well as my ECG I also has some bloods as my vomiting can affect my potassium and iron levels (though I'm on supplements for that so they should come back normal) and she redid my coeliac blood test and she's going to call me on Monday. She also suggested the idea of having an updated endoscopy. For now the main things in terms of managing my gastro issue are increasing my salt intake and having smaller meals (which I'm already doing) which can help with the POTS, avoiding trigger foods, keeping up with my Low FODMAP diet. There's also a few other things which she's going to write and requesting my GP to do (and at least I now have my independent advocate to get my GP to do those things). Hopefully doing those things will keep me going and will slow down to possible progression of my symptoms. During the appointment my cramps and nausea started up - talk about irony! I've got a 6 month follow-up appointment but she said if things get worse they can bring that appointment forward. Even though travelling is really difficult I'm thankful to now be under such good specialists (the local gastro Dr I saw was very lacking on knowledge on how to treat me) and I'm also grateful to the patient transport crew that get me to all my appointments and take such good care of me.